This is the Fred Cain Agricutter, Rotary Cutter, with 45 HP Gearbox, with Shear Bolt PTO Shaft, Round Blade holder, (Stump Jumper) and Laminated Tail Wheel, this is the square deck rotary cutter. 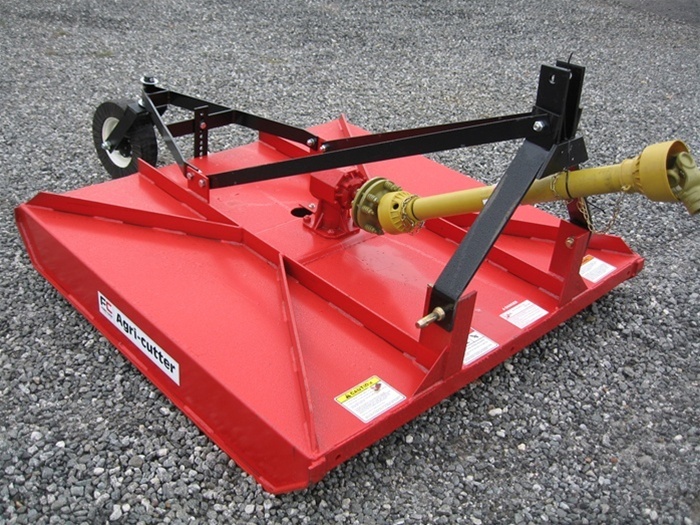 Fred Cain Agricutter Square Deck Rotary Cutter with 45 HP Gearbox and Shear Bolt Protection Free shipping within 1,000 miles! Hi, I'm Ted from Everything Attachments, and we're here today to show you the Fred Cain brand of Agricutter. This is your rotary cutter. Some people like to call them a bush hog. This cutter's been around for a long time. It's been here since I was a kid here. My father's been selling Fred Cain equipment, and they do make the best tillage tools. They make a really good bush hog. The one thing that sets this off from some of the other bush hog is this is a true form deck, in other words, this whole deck, and including this side, is one piece of metal. This has been broke and that's bent down, your skid plate is welded from end to end, has spider bracing, keeping it a good, rigid deck. Bang for the buck, this is a really good cutter. It's got a 45-horsepower gear box. On this model, it has a shear bolt, which, if you were to hit something really hard, it would shear this bolt, and then the snap ring keeps the shaft from being able to come off and cause damage. It does have a stump jumper underneath the bottom, so hopefully you won't shear many bolts, because it's really hard to shear it by simply hitting something with the blades. It does have a good pivoting system here, that let's your top link flex, so when you come down a hill and come down to your flatland, this bush hog has to be able to flex, or it's going to try to pick up your tractor and put a lot of pressure on your tail wheel. So when this is properly adjusted on your tractor, you would want, when you get the height right for what you like to cut, this should be adjusted about halfway back, and then when you lift the bush hog cutter up with your tractor three-point, that will go all the way down, get tight, and the whole bush hog cutter will pick up. One of the good things about the Fred Cain, it has the good laminated tire, and it has a true casted hub in here, with roller bearings that are greaseable. It's not just a fabricated piece of steel. it is a true casted hub in there. It's adjustable right here for your height. It has a hole through the center of the deck to be able to get to your blade bolts easy. So, rotary cutters are one of those things that really needs to be sized properly for your tractor, because most tractors have the horsepower to be able to turn a rotary cutter. In other words, this five foot cutter could be turned with probably as low as 20 horsepower, like a Ford 8M, which only had 24 horsepower, but it weighed 3500 pounds. So, with the new compact tractors, more so than horsepower, the weight of your tractor is what is the most important. So, the do also offer some other cutters that have a tapered back that will eliminate some of the weight, and we're going to have some of those cutters offered also, and it also will give you a little better turning radius when you get near a fence. But keep in mind that your rotary cutter is a heavy piece of equipment, and it sits as far behind your tractor as your front wheels do forward, so just remember to keep some balanced, either front weights on your tractor, or if you have a loader, you might keep the loader on your tractor, and if you're lucky enough to have the quick attach on your tractor, you can leave your bucket off to the side for maneuverability, but just leaving the loader or just something on your tractor really helps keep you stable when you get in a little bit of uneven ground. At Everything Attachments, we'll be happy to help you size the bush hog you need with the tractor you have. Just give us a call or an email and we'll make sure you get the right purchase.